Docsapp Offers and working promo codes.Want a referral program to purchase medicines or have a free consultation from a doctor. Then use Docsapp, which is a medical app. Docsapp refer and earn program is offering Rs 70 free credit when you signup on the app. You can earn more through Docsapp Referral program which give Rs 50 free credit per refer. With this program you can earn maximum of Rs 8500. The best part of the offer is that you can use the whole amount on one order or more than one. So get your Docsapp referral link or code and share it with your friends to earn huge amount of money. A medical app is coming into the e-commerce market. 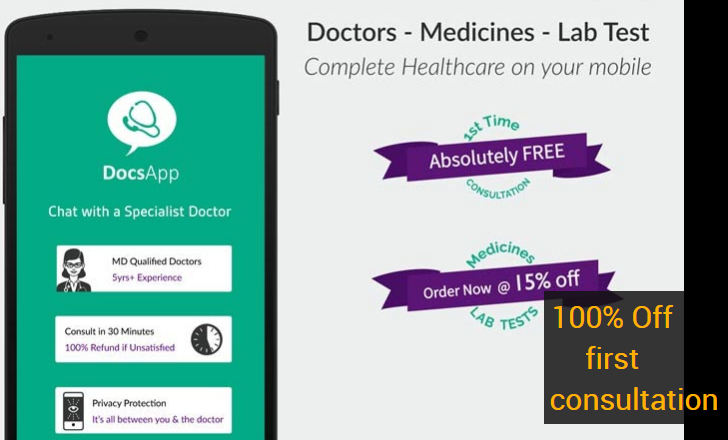 An app named “Docsapp” which is used to order medicines on a high discount rates. An app is also used to consult a doctor without any appointment on online. Talk about health tips or any suggestion without any fees at anytime. The app provide you an instant doctor within 30 minutes. Use Docsapp coupon code or Docsapp discount codes or best cashback deals to get medicines at low price. All the doctors in this project are verified and have an atleast 5 years of experience. NOTE : Must use this Link to download the app. 4) Verify your account using your working mobile number. 5) You will get Rs 20 free credit instantly. You can check it by clicking on the top left menu button and go to ‘Docsapp cash‘. 6) Rs 50 more will be added to your wallet within 24 hours. It will added to your account if you can download the app with some one referral link. 7) So in total a user get Rs 70 in their wallet on signup. 1) Go to top left Menu button on the app. 2) Click on the Refer and Earn option there and you will get your referral link. 3) Share the link with your friends. 4) If they download the app with your referral link and signup on the app, then you and your friend will get Rs 50 referral credit. You can order medicines with the Docsapp cash you earned. You can also use store icon for ordering. 1) First go to ‘Menu‘ then click on ‘Order Medicines‘ and Enter name of medicines and bot give you link to enter address. Now enter address there and submit it. 2) After few minutes, you will get the Payment link, use your DocsApp cash for payment.